Looking for something to do with your nieces and nephews over a beautiful fall weekend? This two-part activity includes a good deed and Thanksgiving crafts! Raking fall leaves can be a tiresome job for the elderly or ill. But it can be great fun for kids! 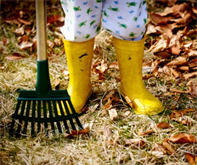 Whether it's helping out family members or a neighbor who could use the support, raking fall leaves not only leaves a lawn looking fresh, but can also create a bounty for the kids. Once your nieces and nephews have raked the leaves off the lawn, let the children choose their favorite leaves from their piles for Thanksgiving decorations! These are great leaf art projects that everyone can enjoy! Leafy Place Mats: Glue dried leaves onto plain plastic place mats. Brush with a glycerin and water mixture to make the leaves shiny. Thanksgiving chargers: Glue dried leaves onto the edges of inexpensive plate chargers (the larger plates that sit under the dinner plates). Place Cards: Use a permanent ink pen to handwrite the names of Thanksgiving guests on a leaf. Place the stem of the leaf in the napkin ring, on top of the napkin, name side up. Welcome sign: Using markers or crayons, have the children create a welcome sign on a large piece of cardboard or poster paper for their Thanksgiving guests. Glue leaves onto the sign to add a festive touch. Place on the door, and your guests will have no trouble finding the right place! Do you have ideas for Leafy activities? Use the comments section to share yours!